Smart Walls versions 2016.3 and 2017.2 were released last month with a new possibility to Split Walls in Revit automatically by predefined configuration. We got a fair amount of additional feature requests, so we developed them and released Smart Walls versions 2016.4 and 2017.3! As you can see in the illustration below, a few more openig types were added, beside Windows and Doors, you can now predefine rules for Generic Openings and System Openings (the ones that are created while editing walls’ profile) as well. Hello and welcome to the next article for architects about our brilliant solution for Revit - BIM Tree Manager . As you may already know, last month we started a BIM Tree Chimpanzee blog series that teaches how this tool can help architects, structural engineers, and MEP engineers use BIM to its full potential, so stay up to speed and take a look at our previous articles! You can find links at the end of this article. Project documentation is a time consuming process, yet it is necessary, so it is useful to know a few tricks to make it a lot easier, faster and smoother. It’s simple when your view fits on a single sheet and you don’t need to think about its’ exact position on a sheet, but that isn’t always the case. So what is the best way to split and place one view on two or more sheets? New Smart Walls versions 2016 / 2017 are released: Split Walls in Revit® automatically! New Smart Walls versions 2016.3 and 2017.2 were released last week! Even though technical documentation consumes a lot of time, which could be spent on work that creates value, it has to be done. So why not try automating it as much as possible? In this article, I will overview a few ways how to create schedules with element views in Autodesk® Revit®, so that you could decide which one fits your needs best. Majority of Autodesk® Revit® users are experiencing a headache that is caused by the time consuming process of project documentation. Even though Revit has legend views, schedules, drafting views, etc., where you can create tables or plain texts with various information that reflect the project, it has some missing functionality as well. We often get details about certain project parts from other specialists who are working with MS Excel. Of course, it is better and sometimes a must to have everything organized in one place. With that in mind, linking the spreadsheets in MS Excel to our Revit file and then, for example, having an ability to place them in sheets near Revit drawings sound like a great plan. Unfortunately, as you may already know, there is no rational way to do that with plain Revit. Luckily, there is a tool that can help. Excel2R is an excellent AGACAD tool that significantly speeds up project documentation process. This tool quickly imports MS Excel spreadsheets into Revit projects. When working with Revit®, BIM professionals hope to complete the majority of tasks automatically and concentrate on creative instead of technical work. However, they often discover that modelling process requires more non-creative assignments than expected. Fortunately, AGACAD tools for Revit save time and money by eliminating unnecessary BIM tasks, letting professionals focus on work that creates value. For example, letting architects to put their mind to creating, let’s say, window design and then generating their legend with lots of different information automatically in a few simple clicks, or letting MEP engineers use their valuable time on designing ducts and then cutting the holes in walls automatically, and so on. 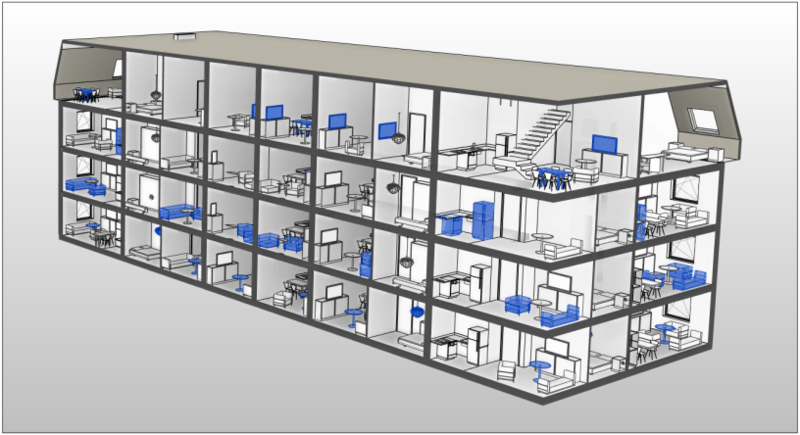 Would you like to work faster in Revit® and spend less time on non-creative tasks? I guess that many Revit users would answer yes to this question as everyone usually strives to be more efficient. Time-saving on various repetitive tasks is one of the biggest headaches when it comes to BIM modeling and completing a lot of steps manually, since usually it takes a lot of time that could be used for other, equally or even more important assignments. Furthermore, the chances of making mistakes by missing important details are not the ones we want to take. Automatized functions and add-ons make our modeling process much smoother and faster, so luckily, AGACAD team has developed a brilliant extension for Revit - Smart Select. Time-saving and completely free of charge tool for architects, structural engineers and MEP engineers that allows users to select desired elements automatically by user configured parameters in just a few clicks.